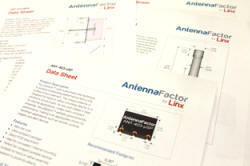 A white paper has been published by Linx Technologies titled, "How to Understand an Antenna Data Sheet." Author, Shawn Hogan, VP of Engineering, writes, "The information on an antenna data sheet is nothing short of overwhelming. It can be difficult to maneuver through to select the best antenna for your design. There are several factors to take into account when looking at an antenna data sheet including: monopole vs. dipole antennas, the electrical parameters, counterpoise, gain and radiation pattern. Our goal is to break down these features so you can use that knowledge to discover advantages and disadvantages of different antennas as they relate to your specific application..."
This article is an entry in Linx's new Blog. The information on an antenna data sheet is nothing short of overwhelming. It can be difficult to maneuver through to select the best antenna for your design. There are several factors to take into account when looking at an antenna data sheet including: monopole vs. dipole antennas, the electrical parameters, counterpoise, gain and radiation pattern. Our goal is to break down these features so you can use that knowledge to discover advantages and disadvantages of different antennas as they relate to your specific application. Let’s talk antenna main classifications. In general, antennas used on low-power devices in the ISM band can be classified as either monopoles or dipoles. A dipole is the most fundamental antenna design. It consists of two identical conductive elements which are usually symmetrical. The length of the antenna is typically half of the wavelength of the frequency being used, giving rise to the term half-wave dipole. Other lengths are possible, but they are less efficient and not as common in ISM band devices. A monopole antenna is one of the elements of the dipole, giving rise to the term quarter-wave monopole. The other element is usually replaced by a ground plane on the product’s circuit board or a metal enclosure on the device. The ground plane or enclosure is called the antenna’s counterpoise. This reduces the size of the antenna by combining it with something that is in the product anyway. It also makes the antenna much more dependent on the device’s construction. This is discussed in the counterpoise section. A connectorized antenna allows the end-user to easily remove the antenna, such as for transportation purposes or to replace a damaged antenna. The FCC in the United States has rules for the type of antenna connector that can be used, so it is important to make sure that the connection is compliant. Permanent mount antennas are designed to be installed by the OEM and not readily removed by the end-user. They may be either connected directly to the device (LP, PML or WRT style devices) or soldered on the device’s circuit board (MicroSplatch™ or JJB antenna). The performance of a monopole antenna is critically dependent upon the associated counterpoise. The counterpoise acts like one of the poles in a dipole antenna while the monopole antenna acts as the other pole. Electrically this gives a complete dipole antenna. The counterpoise is usually a ground plane on the circuit board. The location and size of the ground plane relative to the antenna significantly affects the performance of the antenna in the final design. If the plane in the device is smaller than the one used to tune the antenna, then the antenna’s center frequency will shift higher and the bandwidth will decrease. When reading an antenna data sheet it is important to consider the counterpoise size requirement relative to the space available in the device. If there is not enough space for an adequate counterpoise, then the system range can decrease. Describes the range of frequencies over which the antenna is optimally tuned. This should cover the frequency band that will be used. If it does not, then the range of the device may not be consistent on all of the frequencies used by the device. Typically the where the VSWR is a minimum, or where the antenna is designed to operate. Ideally this is in the center of the frequency band that is to be used. The impedance of the antenna should match the radio that is used in the system. Most RF radios and antennas are matched to 50-ohms as standard practice. If the antenna is not at the same impedance as the radio then a mismatch occurs that introduces loss into the system. This reduces the overall system range. The Voltage Standing Wave Ratio is a measurement of how well an antenna is matched to a source impedance, typically 50-ohms. It’s calculated by measuring the voltage wave that is headed toward the load vs. the voltage wave that is reflected back from the load. VSWR is usually displayed graphically vs. frequency. The lowest point on the graph is the antenna’s operational center frequency. In most cases, this will be different than the designed center frequency due to fabrication tolerances. The lower the VSWR, the more energy gets transferred into the antenna and the better the range of the system. A 1:1 reading is ideal. The radiation patterns are critical because they show how the antenna radiates energy into the environment. A perfect antenna puts energy off in a sphere and is called an isotropic radiator. Real antennas do not have perfect patterns. A normal dipole antenna has a pattern that looks like a doughnut. It is important for a designer to understand an antenna’s radiation pattern and how it will affect the end product’s performance. Gain can be a somewhat confusing specification. Many engineers think of this term in reference to amplifiers, where gain is a measure of how much an amplifier increases the input signal. However, the amplifier puts energy into the system, which makes it an active device. An antenna is a passive device and cannot put energy into the system. Gain, when related to antennas, refers to how an antenna focuses the energy that is put into it. A gain of energy in one direction means that there is less energy in another direction. This has a direct impact on the range performance of the end device. Application notes AN-00500 and AN-00501 go into this in much more detail. All said and done, when it comes to antenna data sheets, it’s important to know that not all antenna manufacturers specify exactly the same way. This is especially true in the case of counterpoise size. If you have any questions regarding data sheets, we’re here to help you out. Shawn received his BS and MS degrees in Physics from the University of Washington in 1991 and 1996. He has worked at a variety of companies in the sensor and measurement industry in both technical and management roles prior to joining Linx in 2008. Shawn works as the assistant goat and chicken wrangler on his family farm when he’s not shepherding new products through development. for engineers of all skill levels to use. The company’s RF modules, remote controls, antennas and connectors make it easy for engineers to integrate wireless features without the hassle and expense of engineering RF functionality from scratch. For customers who need help implementing Linx modules, Linx offers design services including board layout assistance, programming, certification advice and packaging design. For more complex RF solutions, Apex Wireless, a division of Linx Technologies, creates optimized designs with RF components and firmware selected for the customer’s application.